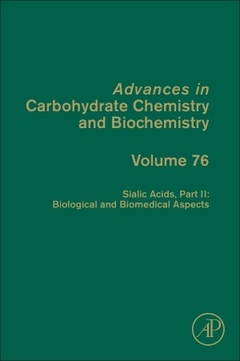 Volume 76, the latest release in the Advances in Carbohydrate Chemistry and Biochemistry series provides critical and informative articles written by research specialists that integrate the industrial, analytical and technological aspects of biochemistry, organic chemistry and instrumentation methodology to the study of carbohydrates. The series' articles present a definitive interpretation of the current status and future trends in carbohydrate chemistry and biochemistry. Prof. David C. Baker has a broad research and teaching experience in the organic and medicinal chemistry of the carbohydrates, including nucleosides and cell-surface carbohydrates that are documented in over 200 publications, presentations, and patents. He was elected a Fellow of the American Chemical Society where he has been active principally in the Division of Carbohydrate Chemistry.